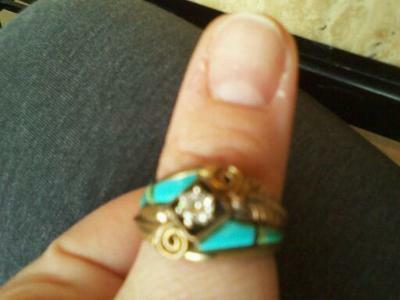 Any information on this Native American ring? What appears to be a mens ring. Someone mentioned to me over the years that they thought it was Native American. An Aunt of mine from Maryland gave this to me when I was very young. I loved putting it on, she eventually gave it to me. 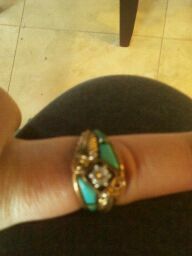 It's been in a jewelry box ever since. 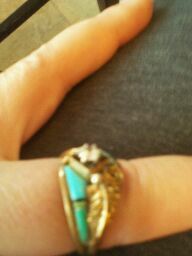 The top of the ring has 2 feathers along side 2 pieces of turquoise that run down each side. There is one center diamond with 2 circular swirl designs. There is 12-K GF (under that) GW on the inside of the band. The markings 12-F GF GW are on the inside of the top of the band.